Many of my weekends over the past few months have started aboard a southbound train that deposits me 150 miles away from home in Champaign, IL. Nick returned to finish his last year at the University of Illinois and we have been traveling back and forth to see each other since September. We weren't particularly thrilled about the prospect of spending time in a central-Illinois college town, but the discovery of Mirabelle Bakery made it all a bit easier. The bakery is closed on Sundays, so nearly every Saturday morning we make the half mile walk from Nick's apartment to downtown Urbana. We stop at Strawberry Fields, the local natural foods store, for coffee and head up the street to wait in the perpetually-crowded storefront of Mirabelle. We always select something to eat immediately on the park bench outside, and often purchase a loaf of fresh baked bread to accompany our dinner. I am a glutton for traditional breads, and Mirabelle may have the finest baguettes that I have ever encountered in the United States. The only complaints I could possibly muster about Mirabelle would be their coffee which is a weak and pedestrian variety tucked away in a self-service corner. But, I do visit for the breads and pastries and I would not suggest that they turn their attention away from these incredible offerings. 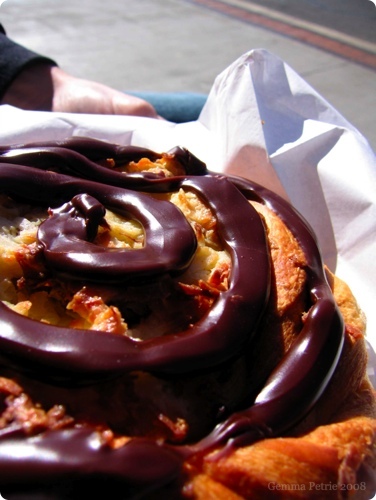 My favorite pastry of all is the Mirabelle Bakery Onion Roll. 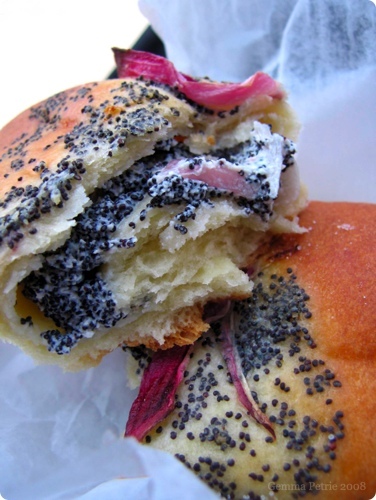 The roll is soft and buttery, stuffed with poppy seeds, sour cream, red onions and an indescribable, delectable savoriness that makes my mouth water just thinking about it. 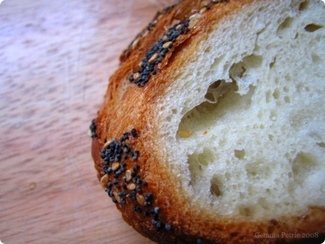 If you have occasion to visit Mirabelle Bakery, this would be my first suggestion to sample. 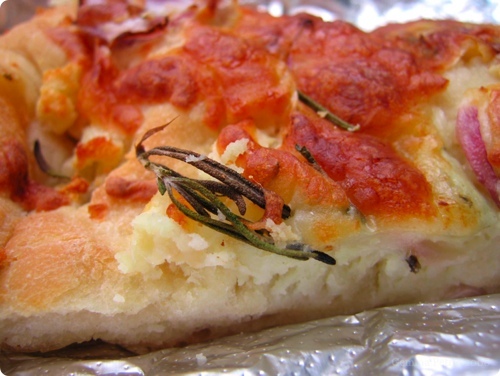 If you have a heartier appetite, their foccacia servings are huge and easily make a meal. The crumb is chewy and tender and the toppings are always very fresh. The other two highlights of Champaign-Urbana have been the Blind Pig, a beautiful bar with over 21 taps and Prairie Fruits Farm goat cheese. This locally produced goat cheese can be purchased at Strawberry Fields, and while a bit pricey (about $7 for 6 oz. ), it is worth every penny. We do not have a car available to us, but I am hoping to find a way to make a trip out to the creamery in the spring, if the owners will have me, to see the farm's operation first hand. 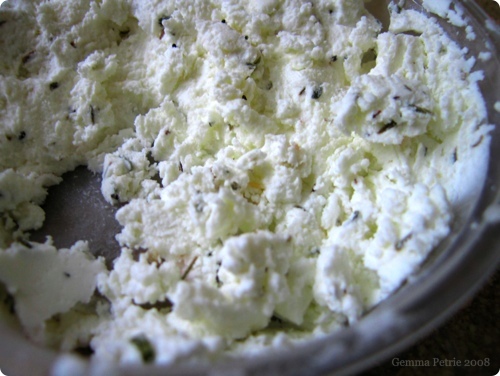 I often fantasize about making my own goat cheese and it would be fun to see a local example. While we would both rather be living a normal life back in Chicago, it has been fortifying to find these high-quality, local and affordable establishments in a town with too many trashy sports bars and fast-food chains. I have to admit that I didn't expect to miss things about Champaign-Urbana, but I will. For an inside look at Mirabelle Bakery and to learn more about the food in Champaign-Urbana from a well-versed resident, visit the lovely blog Champaign Taste. 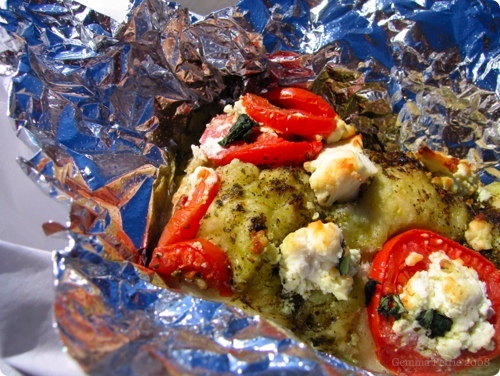 It all looks amazing but that Pesto, Tomato and Goat Cheese Foccacia has me salivating. I may need to stop by when next on my way home via auto! Pro Bono Bakery, I am trying to find pink bread for my daughter's tea party when I came across your Easter article on the internet. Would you be able to provide two loaves of pink bread? I live in Carmel, In so the bread would need to be shipped. Please call me at (317) 985-5344 if this is possible. 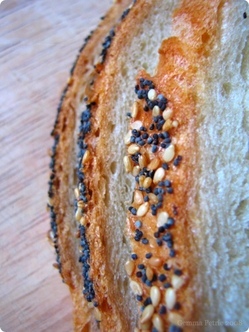 It all looks wonderful but I am especially drawn to the sour cream poppy seed bread it looks delicious. Heavens! 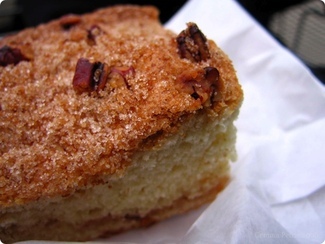 Here I am, scanning your posts, and I start seeing "Mirabelle bakery" and feeling disoriented. Then I read the post and figure things out. You sly dog, infiltrating Champaign-Urbana! Your photos of Mirabelle's offerings are spectacular. I'm so glad you found the place. It is truly a treasure in C-U. And thanks for the kind words about my blog. Jessi, everything has been fantastic. You should definitely stop! Hi Marla, I regret to say that I do not sell my breads at the moment (and I think you may be under the impression that Mirabelle Bakery's breads are mine!) Sorry. Julie, the sour cream and onion bread is really one of the most delicious things I have ever tasted. I am hoping to work up the courage to ask for the recipe. Hi Lisa! Yes, I have been snooping around your area. I am happy to report that I have found delicious ways to spend my time there. Thanks for your post on Mirabelle! Sue, I saw those croissants last weekend, I will be sure to try them soon! They looked amazing. I love the olive bread too! I'll have to get a good picture of it this weekend -- it may be my last trip down there. Pro bono baker, i love your photos from mirabelle bakery, but i am in Romania, and i kan't go there.So if you got a recipe from something you have in the photos, please post here. Thank you, I'm glad you enjoyed the photos. Sadly, I do not have a recipe from Mirabelle. I really wish I did though! Oh! those pastries looks so delicious! Wish I can also go there and have a taste of it myself. Thanks for sharing this post. Keep posting! Thanks Goldilocks Bakery. I wish I could go back to visit too, it's been so long! PLEASE NOTE: I have been forced to hold all comments for review due to some recent comments that do not fit within my published commenting policy. Thanks for your patience. hey! i enjoyed your writings here about mirabelle, but just a couple things from someone who actually bakes pastries there.... the pic u have above is of coffeecake, not mexican brioche, and the other pic you have isn't chocolate brioche, its a german chocolate pastry. we do make a chocolate brioche, but it is quite different. anyway, just wanted to point that out. Thanks for the clarification Alison! It's been a long time since I've been able to visit the bakery, but we were always so confused by their labeling! I asked on several occasions for clarification and the individuals working insisted these titles were correct. How strange! I truly hope to make it down to enjoy more Mirabelle goods soon. Such a lovely place.